George Brett is one of 4 players with 3,000 hits, 300 homers, and a .300 average — the other 3 are Hank Aaron, Willie Mays, and Stan Musial. 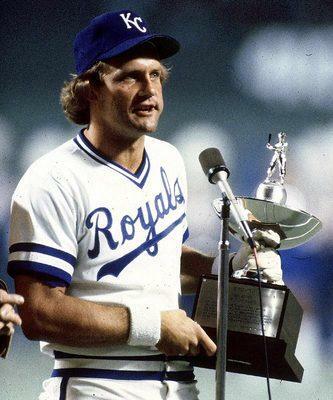 George Brett played his entire career in Kansas City, making the All Star game 13 consecutive times over the course of his 21-year career. Shown here is a type-written letter on Royals letterhead in which Brett obliges the request to write his quote from The Edge, a book of inspirational quotes. 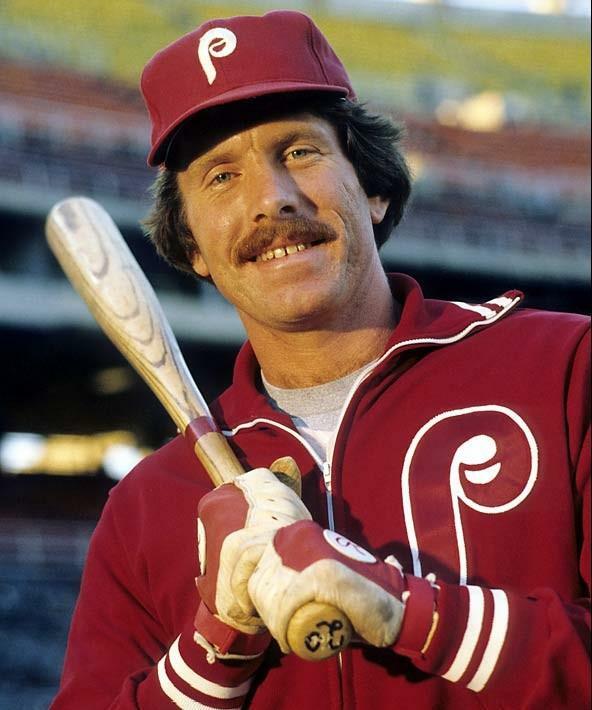 A three-time batting champ, Brett hit a career-high .390 in his MVP year of 1980. 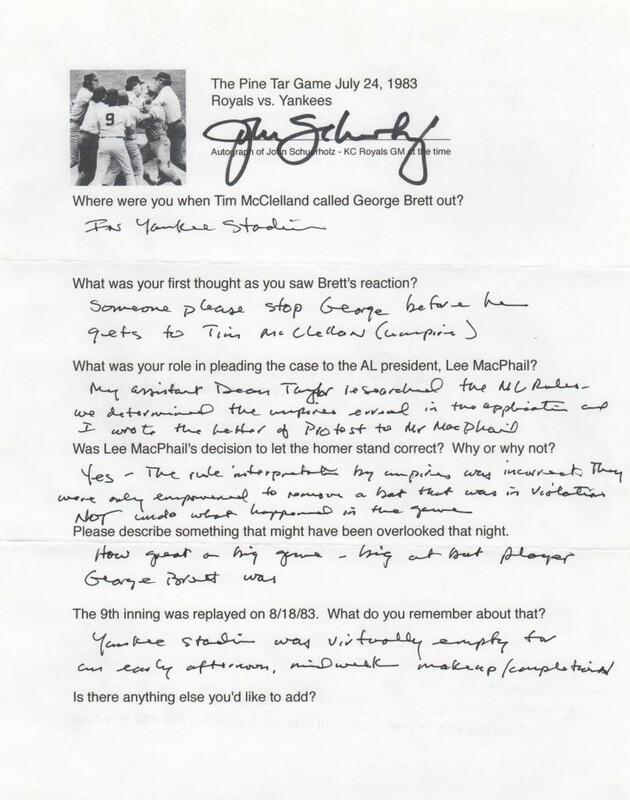 Though the umpires were correct in their application of the rule, Royals’ GM John Schuerholz appealed the decision to American League President Lee MacPhail who overruled the on-field decision. 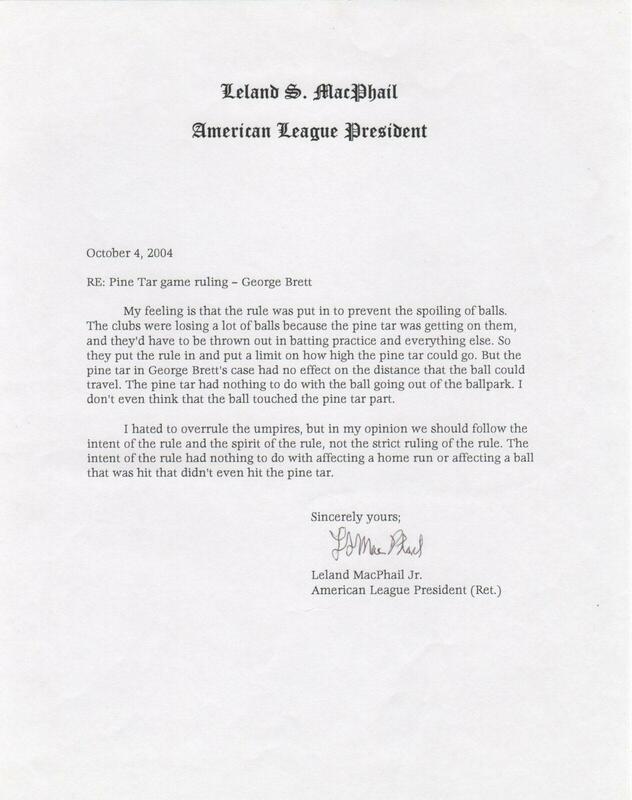 In this letter MacPhail writes about his reasoning and discusses his reluctance to supersede the his umpires’ decision. 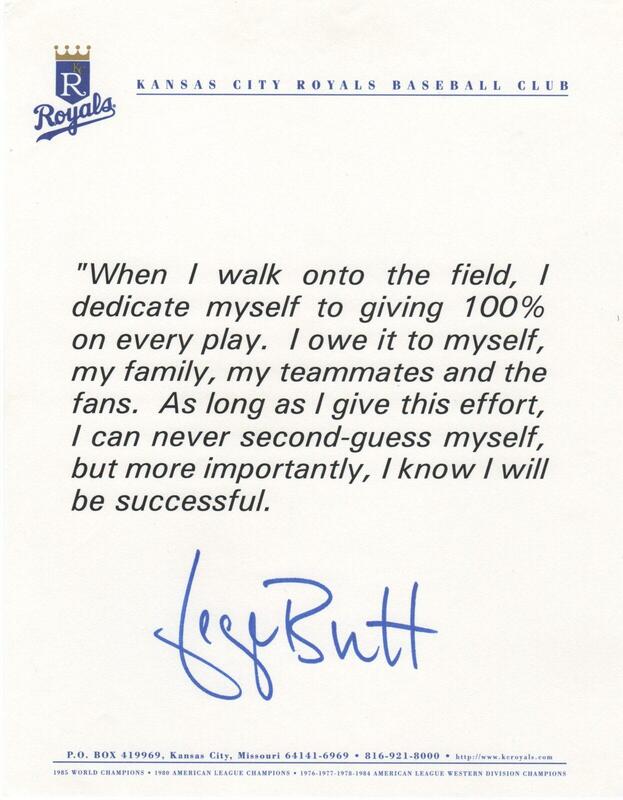 George Brett’s singular most memorable moment in the big leagues was the Pine Tar incident. 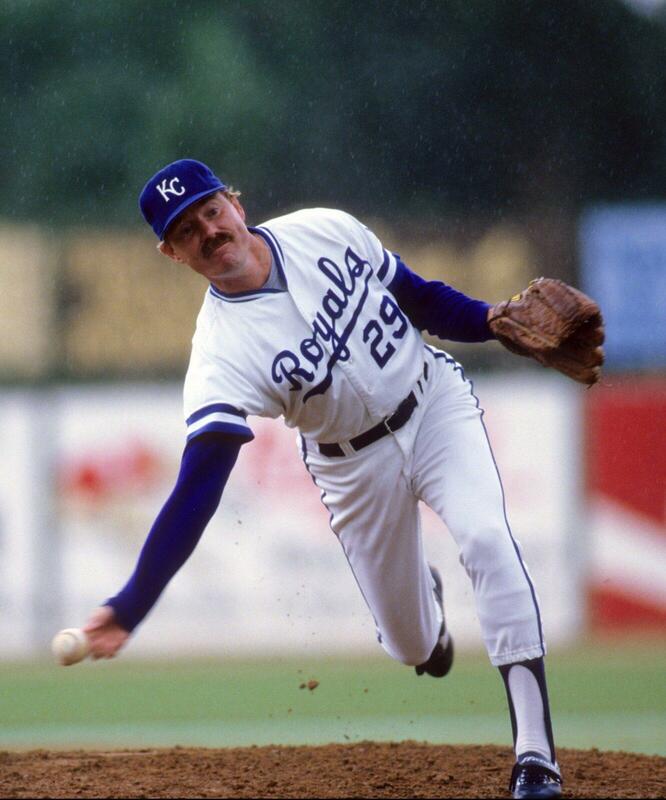 On July 24, 1983, he hit a two-out ninth inning homer off of Hall of Famer Goose Gossage to give the Royals a 5-4 lead. New York manager Billy Martin appealed the play citing a rule that a foreign substance can extend no more than 18 inches from the knob. Home plate umpire Tim McClelland ultimately ruled Brett out and chaos ensued. 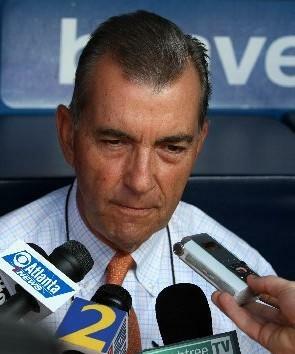 Here are McClelland’s thoughts in which he strongly defends the decision of him and his crew. This provides a besides a behind-the-scenes look into one of the most recognizable plays in the history of the decade. After George Brett’s homer was wiped away by the umpires, KC GM John Schuerholz had to file a letter of formal protest. 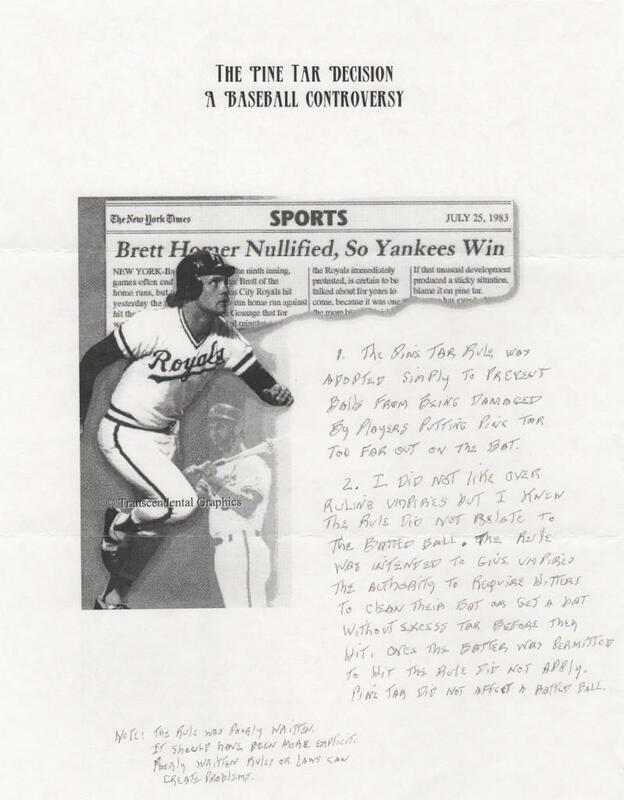 Shown here is a questionnaire in which Schuerholz writes of the protest letter and the events surrounding the Pine Tar game. 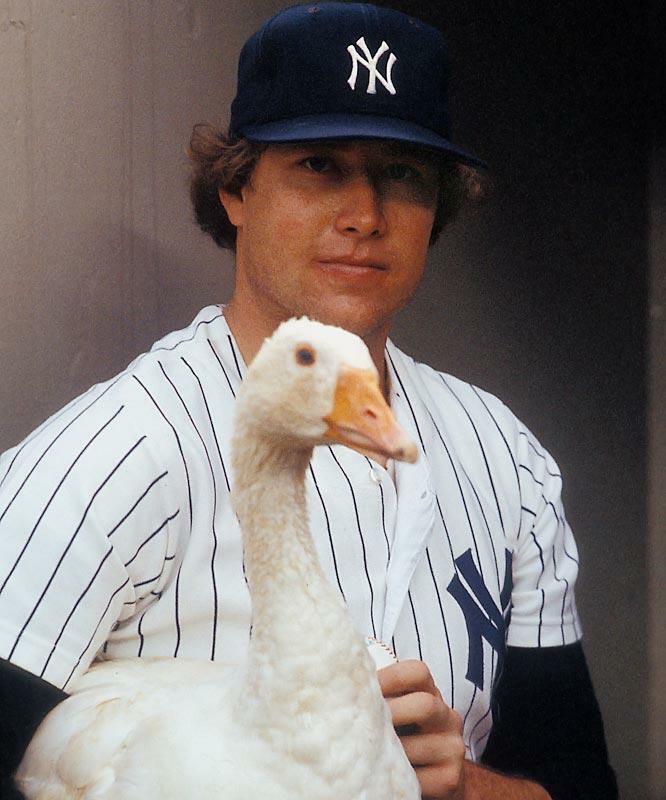 Interesting to note that the 9th inning was replayed and that, “Yankee Stadium was virtually empty for an early afternoon, midweek make up…” Schuerholz himself is a strong candidate for the Hall of Fame. 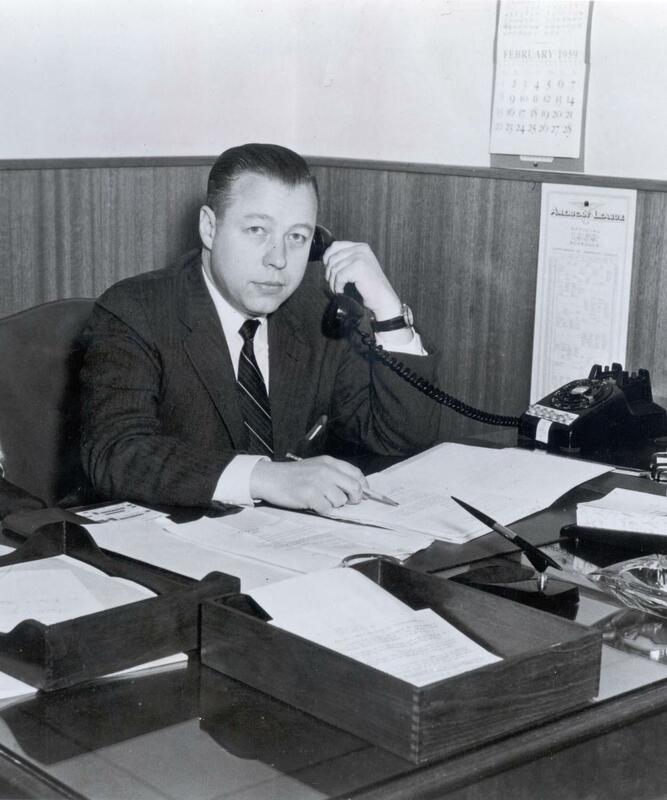 Longtime executive Lee MacPhail joined his father in 1998 when he was voted into the Hall of Fame. 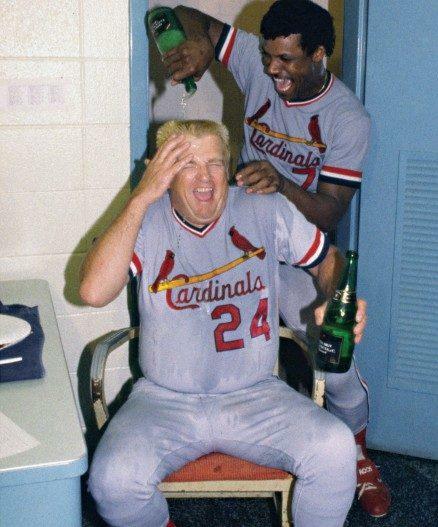 The pair remains the only father-son duo in Cooperstown. 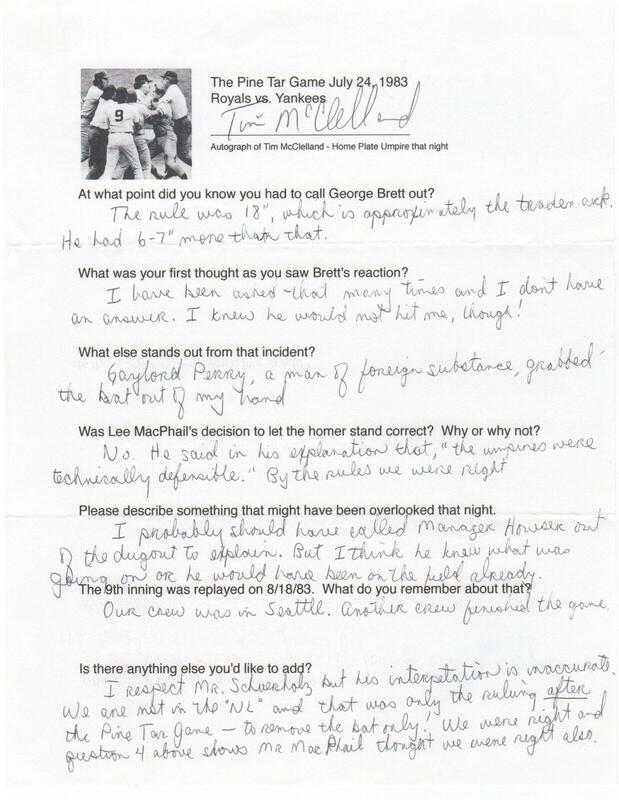 Shown here is a handwritten reflection from the junior MacPhail about his role in the Pine Tar decision. The focus of the letter is the spirit of the rule. He felt the pine tar did not effect the flight of the ball and therefore allowed the homer to stand. What might be a nice piece of memorabilia in many collections is a sort of afterthought here. 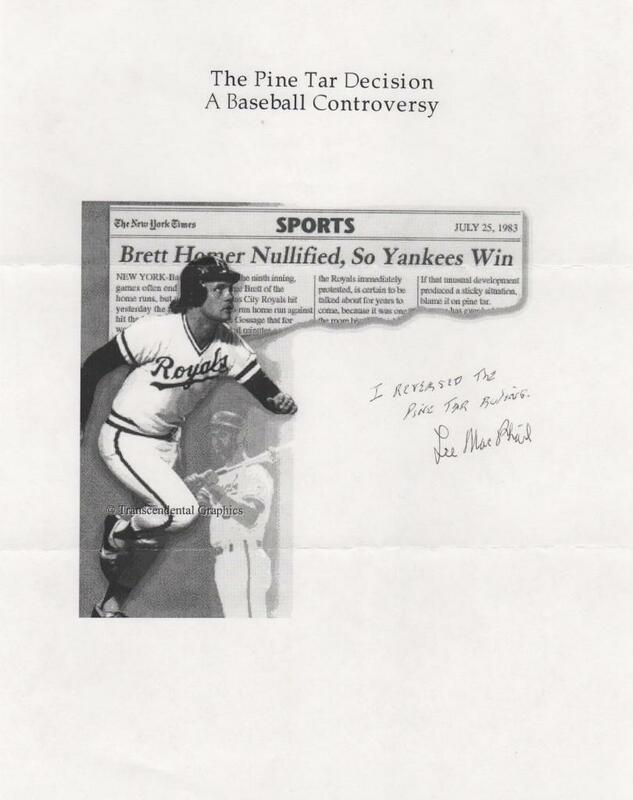 On a piece of paper with Brett’s image and a New York Times headline, “Brett Homer Nullified, so Yankees Win” American League President Lee MacPhail handwrites, “I reversed the Pine Tar Ruling” then finishes it off with his signature.